The Ness of Brodgar is an archaeological site covering 2.5 hectares (6.2 acres) between the Ring of Brodgar and the Stones of Stenness in the Heart of Neolithic Orkney World Heritage Site in Orkney, Scotland. Excavations at the site began in 2003. The site has provided evidence of decorated stone slabs, a stone wall 6 metres (20 ft) thick with foundations, and a large building described as a Neolithic temple. The earliest structures were built between 3,300 and 3,200 BC, and the site had been closed down and partly dismantled by 2,200 BC. The structures at the Ness of Brodgar are made of flagstone, a sedimentary rock found abundantly throughout Orkney. Flagstone is easily split into flat stones and was therefore a good material for fine building work using Neolithic tools. Some of the stone found on site is too thin for floor tiles or wall building, and is understood as the first evidence ever found of roofs. Structures 1, 8, 12 and 14 appear to have been constructed around 3,000 BC. These stand on top of earlier remains that, as of 2016, have not yet been uncovered, but are thought to date to 3,300–3,200 BCE. Some of the individual stones of structure 1 were painted in yellows, reds, and oranges using ochre pigment made of haematite mixed with animal fat, milk or eggs. This is the first discovery in Britain of evidence that Neolithic people used paint to decorate their buildings. Structure 10, artistic reconstruction c. 3000 BC. Structure 10 was discovered in 2008, and was described by excavators as "temple-like". It has walls 4 metres (13 ft) thick and still standing to a height of more than 1 metre (3.3 ft). The building is 25 metres (82 ft) long and 20 metres (66 ft) wide and a standing stone with a hole shaped like an hourglass was incorporated into the walls. There is a cross-shaped inner sanctum and the building was surrounded by a paved outer passage. It is believed to have been constructed around 2,900 BCE, and appears to have been partly rebuilt around 2,800 BC, probably due to structural instability. This is the largest structure of its kind anywhere in the north of Britain and it would have dominated the ritual landscape of the peninsula. Structure 10 was used until around 2,400–2,200 BCE, when it appears to have been "closed" in an extraordinary and unique episode of ceremonial demolition involving the slaughter of several hundred cattle. Bones of approximately 400 cattle-tibias (shin bones) comprise the vast majority of bones found. The bones were laid around structure 10 and an upturned cow skull was placed within it. The tibias appear to have been cracked to extract the marrow, suggesting that this slaughter was accompanied by a feast. All the slaughter seems to have taken place in a single event. Structure 12 was built around 3,000 BCE. It comprises six piers, four recesses and two hearths. It is the southernmost structure so far uncovered, but there are believed to be more structures farther south still underground (some of which, unfortunately, may be under the site's spoil heap). It was made of well-dressed stone but, like several other buildings on the site, appears to have suffered from structural problems and was partly rebuilt. An annexe to the north, added later in the Neolithic, is not well integrated into the original stonework. Structure 14 as it appeared in July 2016. The tarpaulins visible in this image are left over from when the site was covered and closed down (dig restarted 4 July). The tyres were used to weigh them down. Structure 14 was built around 3,000 BCE, roughly contemporaneously with structures 1, 8 and 12. Like them it was built on top of earlier structures. It is the most northerly of the buildings so far uncovered. It has three entrances, four piers, four recesses, and two hearths. Apart from its size it is generally similar in design to structure 8. The ends of this building appear to have been used for different purposes and, as of 2016, the floor is undergoing chemical analysis to determine what they were. An unusual axehead, made from gneiss, and a carinated bowl from the early Neolithic which may predate grooved ware, have been found in this structure. Wickham-Jones, Caroline (2015). Between the Wind and the Water (2nd ed.). Oxford: Windgather Press. ISBN 978-1-909686-50-2. Towers, Roy; Card, Nick; Edmonds, Mark (2015). The Ness of Brodgar. Kirkwall, UK: Archaeology Institute, University of the Higlands and Islands. ISBN 978-0-9932757-0-8. ^ a b c Towers et. al. 2015, pp. 22-23. ^ a b Towers et. al. 2015, pp. 2-3. ^ Wickham-Jones 2015, p. 76. ^ Wickham-Jones 2015, p. 31. ^ Wickham-Jones 2015, p. 18. ^ Wickham-Jones 2015, p. 13. ^ Wickham-Jones 2015, p. 53. ^ Towers et. al. 2015, p. 11. ^ Towers et. al. 2015, p. 10. ^ a b Towers et. al. 2015, pp. 18-19. ^ "... and painted walls". Orkneyjar.com. The Ness of Brodgar Trust. Retrieved 10 July 2016. ^ "Painted walls in Orkney ‘5,000 years old’". BBC News. 26 July 2010. Retrieved 12 July 2016. ^ Sigurd (Towrie?) (25 August 2015). "Tuesday, August 25, 2015". Orkneyjar.com. Excavation Diary. The Ness of Brodgar Trust. Retrieved 10 July 2016. ^ a b c d e f Towers et. al. 2015, pp. 20-21. ^ "Prehistoric roof tiles". Orkneyjar.com. The Ness of Brodgar Trust. Retrieved 11 July 2016. ^ Sigurd (Towrie?) (6 August 2010). "Friday, August 6, 2010". Orkneyjar.com. Excavation Diary. The Ness of Brodgar Trust. Retrieved 11 July 2016. ^ Wickham-Jones 2015, p. 75. ^ a b c Roff Smith (August 2014). "Scotland's Stone Age Ruins". National Geographic. Retrieved 11 July 2016. ^ a b Towers et. al. 2015, pp. 24–25. ^ "Late Neolithic Scotland, c 3000–c 2500 BC". Scottish Archaeological Research Framework. Scottish Heritage. Retrieved 11 July 2016. ^ "A rough timeline". Orkneyjar.com. The Ness of Brodgar Trust. Retrieved 12 July 2016. ^ Sigurd (Towrie?) (15 August 2012). "Wednesday, August 15, 2012". Orkneyjar.com. Excavation Diary. The Ness of Brodgar Trust. Retrieved 12 July 2016. ^ Sigurd (Towrie?) (23 July 2014). "Wednesday, July 23, 2014". Orkneyjar.com. Excavation Diary. The Ness of Brodgar Trust. Retrieved 12 July 2016. ^ "Ness of Brodgar, Stenness, Mainland, Orkney". Orkney College, University of the Higlands and Islands. Archived from the original on 22 October 2008. Retrieved 30 August 2008. ^ Towrie, Sigurd. "Experts stunned by scale of Brodgar structure". Orkneyjar.com. Orkney Archaeology News. The Ness of Brodgar Trust. Archived from the original on 27 August 2008. Retrieved 30 August 2008. ^ a b Towrie, Sigurd (16 August 2007). "Stone wall hints at Neolithic spiritual barrier". Orkneyjar.com. The Ness of Brodgar Trust. Retrieved 16 July 2017. ^ Towrie, Sigurd. "Brodgar Boy". Orkneyjar.com. The Ness of Brodgar Trust. Archived from the original on 6 August 2016. Retrieved 8 March 2018. ^ "'Finest' Neolithic stone discovered at Orkney's Ness of Brodgar". BBC News. Retrieved 10 August 2013. ^ Sigurd (Towrie?) (7 August 2013). "Wednesday, August 7, 2013". Orkneyjar.com. Excavation Diary. The Ness of Brodgar Trust. Retrieved 12 July 2016. ^ A flaked stone with a sharp edge used for cutting. This neolithic tool is named after Skaill Bay, the location of World Heritage Site Skara Brae in Orkney. See "Skaill knife" (PDF). Historic Scotland. Retrieved 21 March 2007. ^ Ross, John; Hartley, David (14 August 2009). "‘Cathedral’ as old as Stonehenge unearthed". The Scotsman. Edinburgh. Retrieved 16 August 2009. 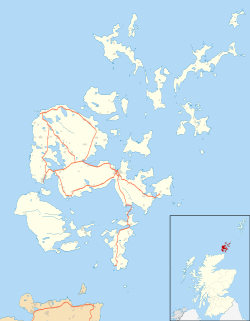 ^ "Neolithic ‘temple’ revealed at site on Orkney". The Herald. Glasgow. Archived from the original on 19 August 2009. Retrieved 16 August 2009. ^ Macintosh, Lindsay (14 August 2009). "‘Neolithic cathedral built to amaze’ unearthed in Orkney dig". Times Online. London: The Times. Retrieved 16 August 2009. ^ "The Ness of Brodgar Excavations". Orkneyjar.com. 14 August 2009. Archived from the original on 28 August 2009. Retrieved 16 August 2009. ^ Management Plan 2014–19 (PDF). Heart of Neolithic Orkney (Consultation Draft ed.). Historic Scotland. 2013. p. 10. "Official excavation site". nessofbrodgar.co.uk/. The Ness of Brodgar Trust. This page was last edited on 30 October 2018, at 11:38 (UTC).